Idyllic depictions at odds with an ongoing tragedy. There are really two art worlds nowadays. There is the world of … well, what do you call today’s avant garde? Call it cutting-edge art, even though it’s much too broad a swath to call an edge. You might as well call it mainstream. It is the art of Jeff Koons, Damien Hirst, Cindy Sherman and Ai Weiwei, to name a few. It is conceptual, ironic and often cartoonish. Then there is a much smaller cohort of traditional realist artists. Everyone knows what realism looks like. At one time, believe it or not, realism was considered cutting edge—at least when it insisted on depicting down-to-earth subjects such as workers in the field, slum dwellers, prostitutes and the like. Today’s realists are a much more genteel lot. They tend to fit into niches, such as portraiture or landscape. Recently, I was reminded of another branch of the realist school—wildlife art. 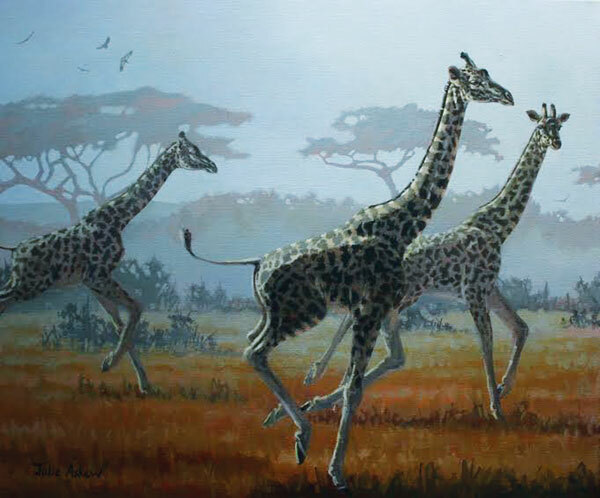 There is apparently a market for paintings of animals in natural settings. And why not? Our culture is rich in photographic pictures and videos of animals. Wildlife photographers’ hard-won images of lion prides, engorged boa constrictors or life inside a beaver den draw people to IMAX® theaters, Animal Planet channel and the pages of National Geographic—not to mention amateurs’ YouTube videos. Why shouldn’t there be a parallel phenomenon for those who want such imagery in the form of a painting or a sculpture? As it happens, New Jersey has one of a handful of American museums devoted to this sort of thing: the Hiram Blauvelt Art Museum in Oradell. It owes its existence to Hiram Blauvelt (1897-1957), scion of a Dutch family with deep roots in Bergen County. Blauvelt was a conservationist in the mold of Theodore Roosevelt. His reverence for the natural world extended to big-game hunting and the collecting of specimens. Visitors to the museum can see some of these, including a stuffed carrier pigeon, an extinct species whose numbers once reached into the billions and is now a conservationist cautionary tale. Blauvelt also collected wildlife art, including a complete folio of Audubon’s The Birds of America and works by Charles Livingston Bull (1874-1932) a former taxidermist and illustrator who was an Oradell neighbor. When Blauvelt died, his will endowed a foundation that oversaw the creation of a natural history museum in the former carriage house of the still extant, though now threatened, Blauvelt Mansion (it’s been bought by the Care One nursing home chain). The 1893 house is a commanding presence in this otherwise subdivided landscape, a palatial shingle-covered fantasy with turrets that look like witch’s hats and a lawn the size of a football field. Next to it, reached by a steep curving driveway, is the matching carriage-house museum. For several decades, it was the sort of place visited by scout troops and school groups. But in the mid-1980s, riding the wave of an art boom, it was expanded and redesigned as a museum of wildlife art. What you see today are bright, spacious galleries displaying paintings and sculptures by mostly contemporary artists—all quite skilled and serious about their craft. 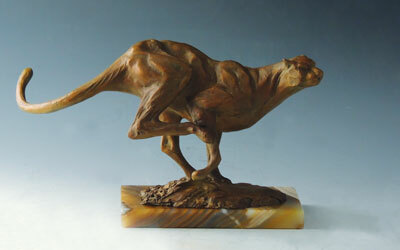 There is a life-size bronze of an ostrich in mid-stride, monumental canvases of elephants—one of which manages to look even larger than life size—and scores of paintings of other, mostly exotic animals in their natural settings: lions, antelope, cheetahs, giraffes, grizzly bears, cranes, moose—even the rarely seen Himalayan snow leopard. Action scenes include a panting wolf pack closing in on some unseen prey, a lion rolling to its feet in the dust, stampeding wildebeests and galloping zebras. Here and there are nods to indigenous wildlife, such as a red wing blackbird perched on a reed or a pair of wild turkeys on a woodland floor. But I dont think I saw a single image of the ubiquitous white-tailed deer. Because deer are such picturesque and graceful animals, you would think theyd make a perfect subject for a wildlife artist. But deer nowadays are considered suburban pests, which, Im guessing, makes them a harder sell to art buyers. Apparently, people dont want paintings of the animal that is eating their tulips and rhododendrons. This points up a paradox with wildlife art. Its content is very market-driven. Theres nothing new about that. Representational artists have long painted what patrons wanted, whether its fewer wrinkles in portraits or a place in a religious triptych. Most of the wildlife art Ive seen, outside of educational displays in natural history museums, presents scenes that adhere to visual truth but omit the larger realities. They filter out any unpleasantness. And the unpleasantness is considerable. After all, we are living in the midst of what has been called the sixth mass extinction in Earths history. 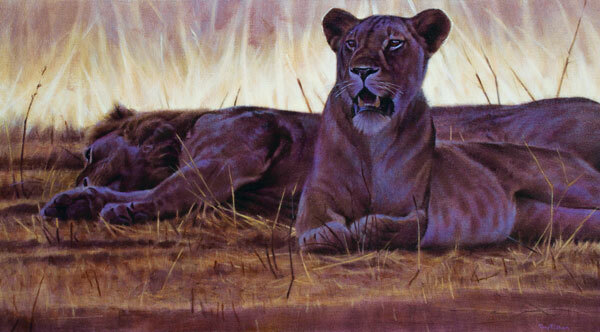 Many of the animals that appear to be thriving in the paintingsrhinoceroses, tigers, elephantsare under assault by humans or are endangered by shrinking habitats. Of course, the artists are well aware of this. 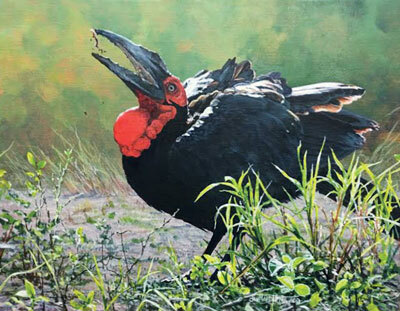 A recent exhibit at the Blauvelt Museum illustrates how the museum and one group of wildlife artists deal with the contradiction between what is actually happening to these animals and the idyllic way they are depicted in the art. 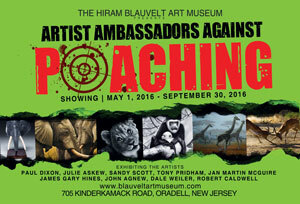 The show, held last year, was titled Artist Ambassadors Against Poaching 1. 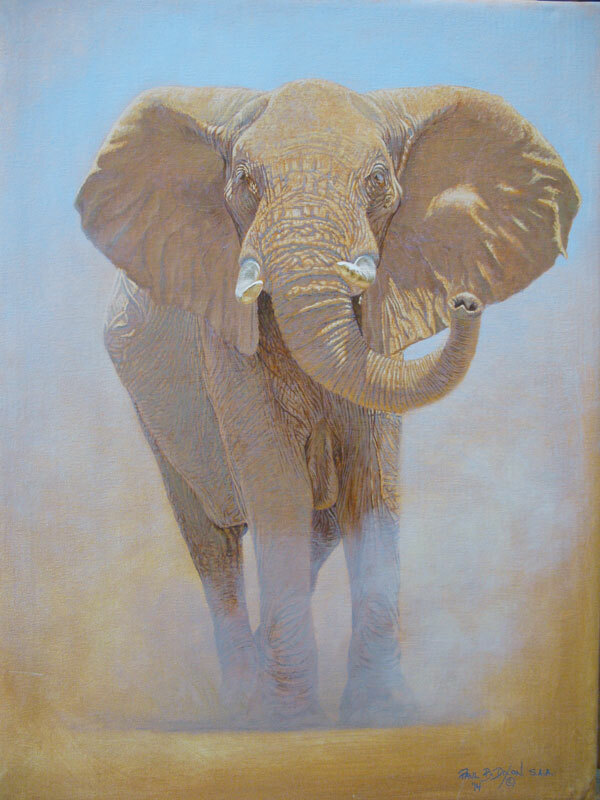 The Artist Ambassadors are nine international artists who went to Tarangire, Tanzania, in the fall of 2013 to learn about the slaughter of elephants for ivory. They spent two weeks immersed in the wildlife of the area and learning about the poaching epidemic. The situation is horrific. Some 30 elephants are slaughtered every day in Tanzania alone. There and across Africa, organized teams of poachers armed with high-powered rifles and chain saws wipe out entire herds and cut off their tusks (sometimes while the elephants are still alive). The ivory chain usually ends in China, where the bloody tusks are turned into chopsticks, good-luck trinkets and other status symbols. Two-thirds of the elephant population is already gone. At this rate, African elephants in the wild will be extinct in fewer than 10 years. Members of the Artist Ambassadors Against Poaching raise money and social awareness, but they dont make art about the poaching itself. There is no effort to change public opinion with their art. In capturing the beauty of elephants and other animals, of course, wildlife art can create bonds across the human-animal divide. But such paintings also contribute to a sense of complacency. After all, everything looks just fine. To make clear the problem, the show at the Blauvelt Museum featured a parallel exhibit of photos and documentary material that told the story of the slaughter and the organizations that are trying to help, specifically African Wildlife Trust and Ivory Orphans. The latter is an effort to find and nurture the baby and juvenile elephants who are left to wander after the ivory-bearing adults have been killed. in the title refers to scratchboard artist Cathy Sheeter, who is the artist-in-residence at the museum. read the message at the top of the billboard. So does extinction. Every tusk costs a life and destroys a family. Is it worth it? The ad appeared on continuous loop, 24 hours a day for a month. It was seen by an estimated 1.5 million viewers. Jay has also done messages for a group called WildAid, which focuses on reducing demand for endangered species products. Her antipoaching message is aimed at Chinese shoppers, the source of the worlds increasing demand for ivory. Jay has said. She says many seem to think that elephants shed their tusks the way deer annually shed their antlers. Her images try to tap in to the Chinese love of pandas and their pride in what has been done to protect them in China. She transformed images of an elephant and a rhinoceros (whose horns are similarly poached for Chinese folk remedies) by giving them the black-and-white markings of pandas. The Chinese text below the altered animals reads: ”Protect the Pandas of Africa—Elephants.